I'm at my final program site up in the city for this summer. Every day we work with Jump Patterns for a while, learn some clogging and then it's time to sit down for a while and explore other kinds of patterns. Nature's patterns, to be exact! A couple weeks ago, at a different site, the kids got so excited about finding a 'nature's number' (Fibonacci!) inside an apple that I had to go out and buy a bunch of lunchbox apples and cut them in half so everyone could have their own apple star the next day. I've never seen kids so excited about numbers, or apples for that matter. I did my apple 'magic trick' again yesterday, but for today I decided to focus on shape and design in nature. 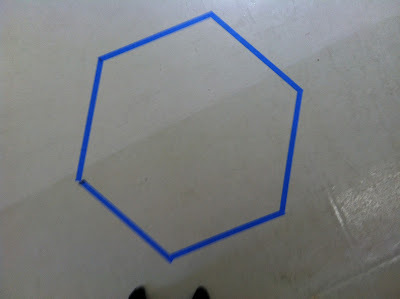 First I taped out a pretty respectable hexagon on the floor in the middle of our dance space. I asked how many sides a hexagon has, but before I'd allow an answer I started asking for volunteers to stand at each of the sides. "One child, one side," I said, "Who wants to stand on the next side? Okay, two children, two sides..." and counted up from there. I picked the little kids on purpose since they had been the most challenged with the dancing. "Okay," I said, "Everyone put your arm in." I guess I wanted there to be some sense of division of the space. Tomorrow I'll got back and put down more tape to show some of the internal structure of this hexagon. "How many corners does a hexagon have? One child per corner...Oh look! Six sides, six corners!" 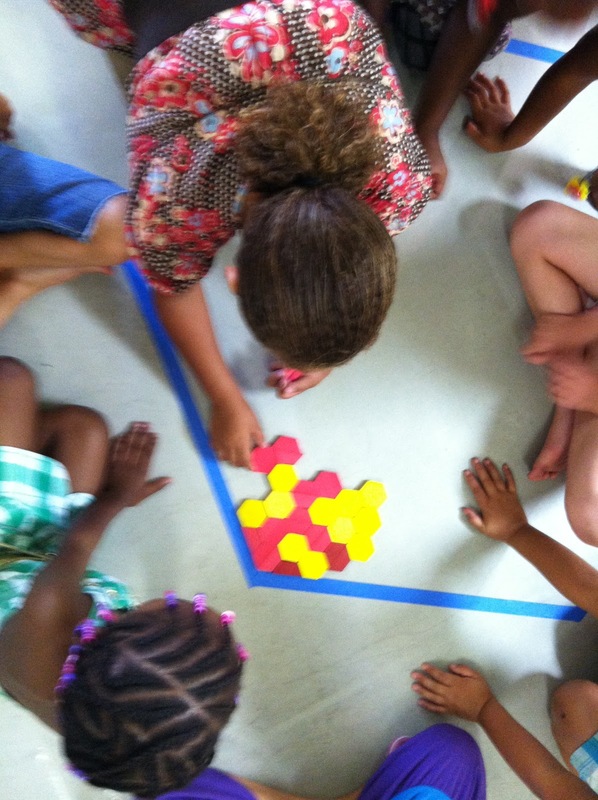 Then each kid got their own pattern block hexagon, or two trapezoids, to add to the tiling I started. "What can you find in nature that looks like this?" I wondered aloud. Only the last class (with more older kids in it) knew right off the bat. 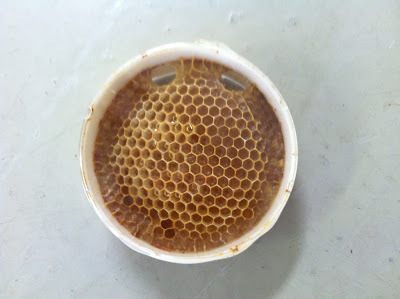 Then they got their very own taste of local honey. It was a bit too strong a taste for most kids, but still a good new thing to try. And then, much to my delight, something wonderful happened. My first class was waiting to go on to their next workshop and were hanging around in the space. They naturally found their way to the hexagon on the floor, made a circle around it and started playing song and chant games. This is exactly the kind of thing that always happens when I put down tape where its never been before. It changes the space and kids notice. Another example from earlier in the morning: I was creating a set of parallel tape lines as I measured out the sides for the hexagon. A little boy came over and jumped over the width and then the length. I wish everyone would put tape down on the floor and then start the camera rolling to record all the awesome things that happen when kids discover this restructuring of their world. It was the perfect, perfect, perfect Saturday, for math and just about everything else. After months and months of cruelly hot weather with muggy 80 degrees by 7am every day, one recent Saturday morning we woke up to 60 degrees, a clear blue sky, and even some mist. The kid and I walked the two-plus miles downtown to the Farmers' Market via a paved trail that runs miles through our little city. Lucky for us and our walkabout math habits, the lamp posts on the trail are numbered. I was considering musing aloud what the half of each number would be when the kid spontaneously starts marching and, along with this steady rhythm, she starts to chant: "Eight plus eight is sixteen. Sixteen plus sixteen is thirty-twooooo. Thirty two plus thirty two is six-ty-four! Sixty-four and sixty four are...hold on...[pausing, eyes unfocused, obviously concentrating internally] ... one hundred twenty eight! [marching resumes] One hundred twenty eight plus one hundred twenty eight are..."
I don't remember how it went at that point. We've not really done mental addition that high, but she made some mighty efforts nonetheless. And, as we still had a ways to go, she started a couple more rounds of doubling, one starting at fourteen. The other I can't recall. My kid has been wanting a waltz partner for like forever. I'm not sure L. knew what hit him! And, as for dance (and math) my kid seems comfortable in the phrasing and ratios of a number of time signatures, 3/4, 4/4 and cut time included. We then moved on to other regular market activities, like meeting the kitties from the shelter. No math there, but I suppose someday we'll find it. There's a lot of great spiral math in the fountain outside city hall. No water in it this day, but kids regularly start in the center and splash spiraling outward, or float bark boats in the reverse direction. 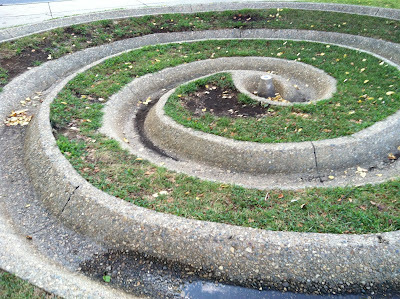 The spiral actually opens way up on the left there, meandering in curves around until it meets the actual fountain. And, although the water in the spiral fountain had been turned off for some reason, it didn't stop the kids from playing. Apparently my girl and L. had been searching for big and interesting pieces of birch bark on the ground when she ran over to me all excited about finding a map of the fountain drawn in pen on the bark "with an X on it!" Of course, that had to mean treasure was close by. And, of course, they started trying to follow the map (surprisingly, almost to scale) of the fountain area. They got completely engrossed in figuring out how to read the map to find the location represented on the map by that curious X. At some point they recruited another girl, maybe older? It's hard to tell because my kid is pretty short for her age. Even L. who is a year and half younger is half a head taller than her. Anyhow, they pondered, and searched, and retraced their steps over and over. After about fifteen minutes I realized that they were looking for an actual X on the ground. At that point I stepped in and wondered aloud whether someone who had hidden treasure would want to mark the spot on the ground or not. I mean, really. If you've got treasure you really don't want anyone to know about it, right? The three kids finally decided they knew the exact place where the treasure was buried and I had to agree. They had done a perfect job at reading the map but couldn't find anything. The finally decided the treasure was under the cement trough somewhere and inaccessible. A little downcast, but ever perseverent, they moved away from the spot to talk some more about the whole situation. "Hey, guys! Weren't you just over here? Come here, and take a look. I think I might see something..."
My bystander friends were looking on at a distance and we all just beamed at how excited the kids were to find their treasure. They figured out how to divide the money equally. I'm not sure, but they may have wondered why it wasn't more than 33 cents but that didn't stop them from telling their story over and over to anyone who would listen. You know, the story about The Day -- the day they followed a found map to buried treasure on city hall grounds. Perfect. On Monday I read The Cat in Numberland by Ivar Ekeland with my daughter at the library (thanks to a reminder about it from Sue VanHattum at Math Mama Writes). We read it last summer when she was a new six and the kid was really excited to see it again. She's at a better math comprehension level for it now and we consume it whole in a quiet, sunny corner of the children's section. This time around we notice the title page with the cat looking at itself looking at the title page looking at itself looking at the title page...recursion! Anyhow, the hotel owner is griping about Zero and how there's no room for Zero at the Hotel Infinity. And, to top things off, the owner doesn't think it's a good idea for Zero to room with Number One at the Hotel Infinity because how will he tell them apart from Number 10? Luckily the numbers are personified in the illustrations. Unfortunately the hotel owner doesn't seem to notice this. My kid does, though. She says [referring to the illustration of 1 and 0 next to each other, compared to the number 10]: "There are two heads [one for 1 and one for 0]. Ten only has one head." (The head on 10 was on the numeral one.) Not that this has any direct math 'value' per se, but it was still interesting to me that she noticed this. I forget exactly which part of the book we were in at the time, but at some point the cat, who is always thinking and "trying to figure things out", wonders why, if the hotel is full now, there are always more rooms available. (Or something like that.) The kid notices the infinity sign in the illustration (figure 8 on its side) and she starts tracing it in the air saying to herself: "It goes on, and on, and on, and on..."
This morning, a summer virus with a fever (after a winter of no illness) has the kid on the sofa listening to the Charlotte's Web audio book. At some point even that isn't enough to distract her from her discomfort so I head to the couch to entertain her. She asks me to draw pictures for her (and graciously tells me I can use any of her sketch books that I want!). I'm really not inspired to do draw but I remember something I saw recently on the Math Munch blog -- Vi Hart doodling musically/visual frieze patterns. I've always been a doodler, so I decide to experiment with my own frieze patterns. I'm not sure if they're exactly what they're supposed to be but they're fun to make. I erase a few, especially the ones that look like they have eyes. Too much for a kid with a fever! The kid is absolutely thrilled with the ones we kept, especially the last two. I think the frieze patterns/designs have something to do with infinity, and so I end this post now where I began it, discussing recursion and infinity. I love it when that happens! I'm in the middle of summer programming. It's Math in Your Feet in a lot of ways but also not completely like the program I do in schools. It's more like a whirlwind of percussive choreography, rhythm, and patterns of all kinds. There's also a lot of math in there as well, just not explicitly. My reasoning for this that kids need as much exposure as possible to patterns in multiple, diverse contexts. These kids I've been working with, for example, are a perfect case in point. When asked on the first day to find patterns in the room in which we were working, they were at a loss. In all the groups, color patterns were found first. Then somebody would notice a sequence of objects, but it didn't repeat. A potential pattern unit, but not a pattern in itself. Even the three examples of simple tilings in the room (floor, ceiling and walls) escaped notice, even when I pointed them out. Patterns are more than sequences of colors. They are more than two dimensional shapes. They are sounds, movements, expressions, order. They are long and short. They repeat. They change. They're everywhere. So, when I say we're not talking about math explicitly I mean we don't need to talk about it because we're doing it. Calling it 'math' interrupts the flow we've created -- sometimes just doing and experiencing is enough. This doing time is a chance to get swept up in the creating, to be fully engaged and amazed and delighted in your own abilities. I believe this because, simply put, that is what I find best about learning something new. On top of the sheer fun of watching kids engage in new pursuits like percussive dance, one of the reasons I'm enjoying doing the summer version of Math in Your Feet is that I have leeway to experiment with how I deliver the program, engage my young dancers (right now ages eight to eleven) and how I set up the space. In the videos, below, you can see what I'm trying out right now. This big grid isn't the normal setup for Math in Your Feet but I was really excited to tape out the space this way. Normally, when kids start making up their own dance patterns they usually get their own personal square dance spaces taped out in individual groups of two, each pair slightly separated from the other groups. I'll be very interested in how the new set up works out (or doesn't). Their movement is a natural kid reaction to squares -- Hop Scotch! But in this second little clip you can see how they started exploring rows as well as columns. 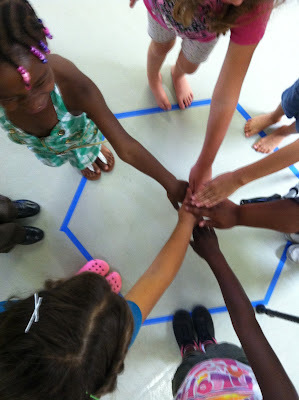 Later, during our class time, when we were talking again about other kinds of patterns they could find, other than the ones we were making with our hands and feet, they noticed that each square of the large blue grid was made up of four smaller tile squares. Given that on the first day they never even noticed how the floor was designed when I asked them about patterns in the room (before I put down this grid), this was a huge step forward at identifying and describing the structure of their environment. Speaking of patterns, I've also been sneaking in some Fibonacci numbers as well. But that's for a future post... In the mean time, here's my original love note about floor tape and its myriad uses. And, one of my favorite posts in this blog about how the tape on the floor serves as the 'third teacher' in my Math in Your Feet residencies. I'm excited to share one of my daughter's math discoveries via video, for the first time ever! I just caught up to this technology last week and am thrilled that I can put my new phone to immediate use. Yesterday she called me over to the keyboard to share something she had discovered. We have always left all kinds of musical instruments around the house for her explore as she will. She has not yet had any formal music lessons (except for three or four penny whistle lessons from her dad) but her current piano style can be loosely categorized as jazz improv and/or piano bar; she really listens to the rhythms and melodies she creates and, even without 'technique', she is making real music to my ears. None of this is really earth shattering, but any time a child moves her understanding of a math concept into a new mode or realm, it is cause for celebration. I think it shows that real learning is happening. As the mother of a narrative-driven first grader, I have become a huge fan of the math storybooks out there. I wish there had been more of them when I was a kid. My daughter and I love books written by or supported by Marilyn Burns, like One Hungry Cat by Joanne Rocklin (it's about division). I also like Loreen Leedy's books, on all sorts of math topics, and the Math Start series as well. Our favorites are probably all the books in the Sir Circumference Series. On the other hand, we've really enjoyed learning math by finding it wherever we are and in whatever we're doing. Since about February we've been paying attention to our physical world and finding as many different examples of geometry in our lives as we can. It's quite stunning how beautiful and full of math even a city sidewalk can be if you have your math glasses on. Back in May I wanted to start looking for spirals but only found two examples. One in a garden and one in our local playground. Long story short, at some point my daughter picked up on the spiral thing and started pointing them out, only to have me say, "No, those are actually concentric circles," which then lead to a few days of clarification about what a spiral is and isn't. Now she sees them everywhere! We're a team, her and I. It's really fun that things we have taken for granted all our lives suddenly have a new dimension. Which is why, I think, that a recent return to reading familiar picture books from our home library made me notice math in otherwise non-mathy books. Here are some examples. Maybe you have more? In nature, every snowflake has the same structure yet each one is different from every other snowflake. That's not exactly the case here. How many different kinds of snowflakes can you find? How are they different and how are they the same? Caps for Sale by Esphyr Slobodkina is another classic picture book and also full of pattern and sequencing. In my summer work recently, and also from years of work in my residencies, it's clear to me that children don't have enough experience identifying patterns and sequences in different contexts. "First he had on his own checked cap, then a bunch of gray caps, then a bunch of brown caps..."
I imagine that none of this is new news, but with my new math eyes if I ever have the opportunity to read this book to a three or four year old again I will probably pause the story after the monkeys throw down all the caps and see if the child can tell me the order the caps should be in when the peddler puts them back on. And then have fun dressing up with our own hats! One final book, for now, is our beloved Llama Llama Red Pajama book by Anna Dewdney. I still remember leaving early one morning for work when my kid was 22 months old and having her look up at me reprovingly and quote the line: "Llama llama red pajama, waiting waiting for her mama..." Sniff. Anyhow, when you first open up the cover you see an incredible variety of painted squares that show up again on little llama's quilt. Look at all those colors! And the patterns? Some are circles some are lines, but there are differences. Can you tell me what they are? My eye was also drawn to the shapes in the doors, windows and railings within the illustrations. This story is so engaging that you may not want to interrupt the rhythmic, rhyming flow to discuss this stuff, but...if you're going to make comments about the wonderful illustrations anyhow, a few math themed comments like "Oh, look here! I just noticed..." would fit in seamlessly. So, now I'm curious what other books are out there that have this kind of 'hidden' math? I just thought of one more book: My daughter listened to the novel Half Magic on CD back in the fall. The kids find a charm that gives them half their wish, and they quickly learn to wish for twice as much as they want. It's fabulous. What other kinds of books have this kind of hidden math? I'd love to hear your ideas! p.s. If it's not already clear, I am not financially involved in any of the books I've mentioned or trying to make money with the use of these images. This blog is about sharing ideas and thoughts only. We had a nice mini-conversation about how many straws/edges she needed to build up from the triangular base to build the tetrahedron. Proving, yet again, that children are like cats. When you're engaged in an activity (like cutting straws for next week) and not paying them any attention, both a child and a cat will become intensely interested in doing what you're doing, or at least something related. At least my daughter doesn't lie on top of my laptop's keyboard. The Characters: 30 excited, wiggly seven and eight year olds who like to dance but who needed a story to help calm down and focus before we could start. Wow, it's really hot outside today. You know where it's really cool? At the top of a mountain. [Cutting a triangle out of the paper.] But when you climb a mountain you have to work really, really hard, step by step. [Speaking dramatically, while cutting steps up the side of the triangle.] And when you get to the top of a mountain, you're so excited to be there that you shout HOORAY and the sound echoes all over the place. Me: Would you look at that! He's got a rhombus inside him. Who knew? Masses: Ooooooooooo....! A mask! A monster! Me: And look...if I turn it upside down and it looks the same! Me (holding scissors and cutting while I talk): Well. Look at that. The square really likes being a triangle but he's finding it hard to walk down the hall. Two of his corners are manageable, but that extra one sticking out is causing him some trouble -- he keeps poking his friends. He's thinking he might like to smooth out those corners. [Cutting away at the point where all the folds meet.] I think he'd like a few more curves as well. [Cutting, cutting.] But he'd still like some triangles on the inside. [Holding the cut triangle up.] What does he look like now? Masses: OOOOOOHHHH! Two dogs! Or a moose with antlers! Suspense. Drama. Intrigue. These stories had it all and I was thrilled to provide a moment of awe and wonder with these simple tools. Funny thing was, the next day it was old news. But, in the moment? The kids' reactions while I was folding and cutting and scraping up a story to tell with it? That was a pure magic math moment.